Recent advances in the area of emotion-oriented computing present opportunities to enhance interactions with games and entertainment applications by an emotional component. While users interact with an application, their emotional cues are recorded and analyzed to enable the application to dynamically react and adapt to them. By putting emotion at the heart of interaction, emotion-sensitive technologies contribute to more engaging and memorable experiences. At the same time, the integration of emotion-sensitive technologies into games and entertainment bears great potential for emotional learning. By exposing people in-situ to selected stimuli in a game-like setting, they may learn to cope with negative emotions associated with socially-challenging situations, such as job interviews, negotiations or public speaking. In my talk, I will describe various international projects to enhance game-like environments by emotion-sensitive technologies including artistic installations, interactive story telling as well social coaching. Elisabeth André is a full professor of Computer Science at Augsburg University, Germany and Chair of the Laboratory for Human-Centered Multimedia. Prior to that, she worked as a principal researcher at DFKI GmbH where she has been leading various academic and industrial projects in the area of intelligent user interfaces one of which was honored with the European IT Prize. Her current research interests include affective computing, multimodal user interfaces and social robotics. 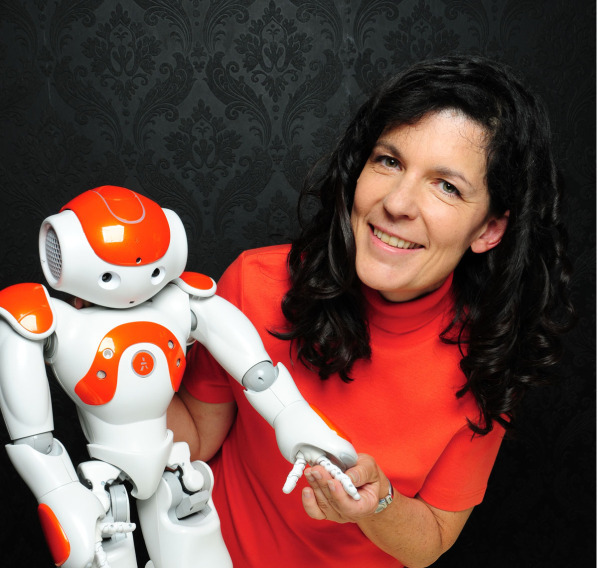 Elisabeth André is on the editorial board of ACM Transactions on Intelligent Interactive Systems (TIIS), Artificial Intelligence Communications (AICOM), Cognitive Processing (International Quarterly of Cognitive Science) and Autonomous Agents and Multi-Agent Systems (JAAMAS). In summer 2007 Elisabeth André was Fellow of the Alcatel-Lucent Foundation for Communications Research. In 2010, she was elected a member of the prestigious German Academy of Sciences Leopoldina, Academy of Europe and AcademiaNet. She is also an EurAi Fellow (European Association for Artifical Intelligence). Storytelling is a pervasive part of the human experience--we as humans tell stories to communicate, inform, entertain, and educate. Interactive narrative is a form of digital interactive experience in which users create or influence a dramatic storyline through their actions. In this talk, I present research on using artificial intelligence to create and interactively manage novel narrative structures for entertainment, games, and other applications. I will conclude with a roadmap for the ways in which computational narrative intelligence can facilitate the creation of intelligent applications that benefit humans and facilitate human-agent interaction. Mark Riedl is an Associate Professor in the Georgia Tech School of Interactive Computing and director of the Entertainment Intelligence Lab. Mark's research focuses on the intersection of artificial intelligence, virtual worlds, and storytelling. The principle research question Mark addresses through his research is: how can intelligent computational systems reason about and autonomously create engaging experiences for users of virtual worlds and computer games. Mark's primary research contributions are in the area of artificial intelligence approaches to automated story generation and interactive storytelling for entertainment, education, and training. Narrative is a cognitive tool used by humans for communication and sense-making. The goal of my narrative intelligence research is to discover new computational algorithms and models that can facilitate the development of intelligent computer systems that can reason about narrative in order to be better communicators, entertainers, and educators. Additionally, Mark has explored the following research topics: virtual cinematography in 3D virtual worlds; player modeling; procedural generation of computer game content; computational creativity; human creativity support; intelligent virtual characters; mixed-initiative problem solving; and discourse generation. Animation studio Job, Joris & Marieke will show their work and explain what a bloody toe, Waterloo by ABBA and an imaginary duck have to do with their films. Job, Joris & Marieke is an animation studio. Their work can be described as cute, funny, poetic and sometimes disturbing. They work on commercials, educative projects, music videos and short films. The music video ‘I’ll Take You Along’ which they made for Dutch rapper Gers Pardoel became a big hit on Youtube in 2011 and has over 19 million hits by now. Their work reached even a bigger audience when their short film A Single Life was nominated for an Oscar in 2015.